Glucosamine and MSM Glucosamine sulfate with methylsulfonylmethane, or MSM, is another type of glucosamine dietary supplement. Methylsulfonylmethane is a naturally-occurring sulfur compound typically found in many grains, fruits and vegetables. It is needed by the body for the synthesis of cartilage and other connective tissue. improve flexibility MSM is highly effective in improving joint flexibility. Additionally, it helps to produce flexible skin and muscle tissue. This leads to an increase in overall flexibility due to a restoration in the tissues. MSM increases the absorption of nutrients so that the energy expenditure on digestion is vastly reduced. MSM might be used in combination with glucosamine to improve the The combination of MSM with Glucosamin provides better and more rapid improvement. increase energy MSM increases the absorption of nutrients so that the energy expenditure on digestion is vastly reduced. MSM is extremely helpful in improving overall energy levels. MSM goes into the body the permeability of the cell greatly increases, enhancing the absorbtion of nutrients and oxygen. absorb more vitamins and minerals Co-enzyme Q10 locks with MSM, which means that the body may fully utilize this nutrient, it must have MSM with it. Pantothenic acid, Vitamins A, D, and E, inter-enzymes, amino acids, selenium, calcium, collagnol and dismuzyme are just some of the things that the body does not utilize properly unless it has MSM to lock with. With more MSM in the body, vitamins can be utilized more effectively and therefore become much more beneficial. 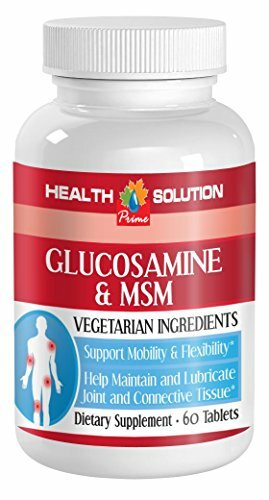 Msm pills - GLUCOSAMINE AND MSM - build healthy skin cells (1 bottle): Proper nutrition is definitely an important aspect to building strong muscles, bones and joints. Our natural Glucosamine and MSM supplement are the substances naturally found in healthy cartilage. it may help to improve joint mobility, promote strong bones and strong joints. BENEFICIAL FOR HEART: Potassium chloride may benefit your heart. Supplements with Potassium chloride may be significant improvement to their cardiovascular system, specifically left ventricle function. The left ventricle is one of the four chambers of the heart and noted to be the powerhouse, because it pumps blood to the rest of the body. MUSCLE IMPROVEMENT: Potassium plays an important role in regular muscle contraction. A sufficient concentration of potassium is required for the regular contraction and relaxation of muscles. Potassium maintains optimal muscle and nerve function, and helps to keep our reflexes fast because it stimulates the neural connectivity of muscles and the brain. BENEFICIAL FOR BRAIN FUNCTION: Potassium channels play a key role in maintaining the electrical conductivity of the brain and support brain function. It is also involved in higher brain function like memory and learning. GLUCOSAMINE AND MSM - Each bottle - 742mg - all natur kal Non-GMO, Gluten-Free formula may reduce anxiety and stress and stimulate nervous system, improve skin health, maintain optimal muscle and nerve function. Made in USA. Scientificaly standartized to the highest level of our active principles. 30-day 100% money-back guaranteed.